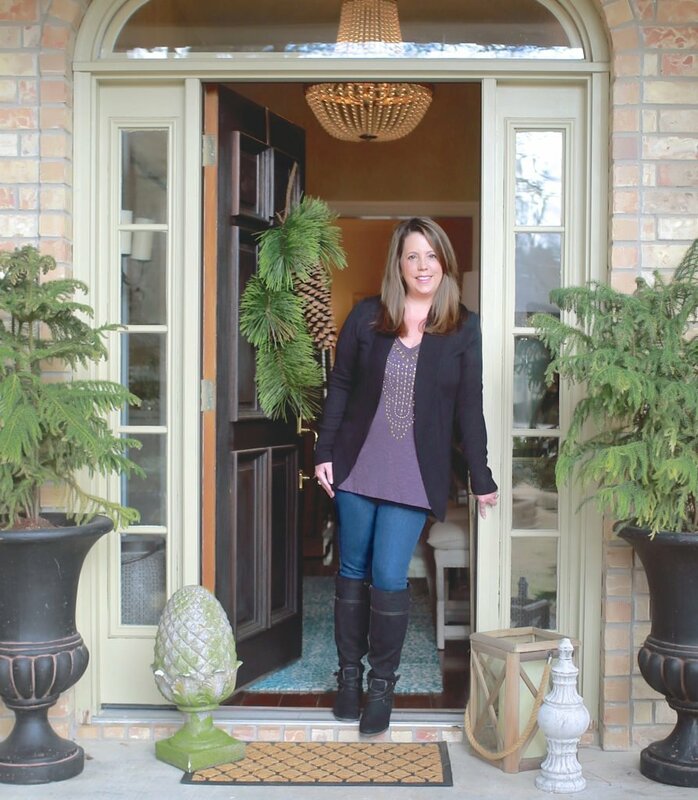 When I went to Salt Lake City to tour the 2017 Parade of Homes this year, I noticed lots of beautiful home design/building trends that I have been so excited to share with you guys. 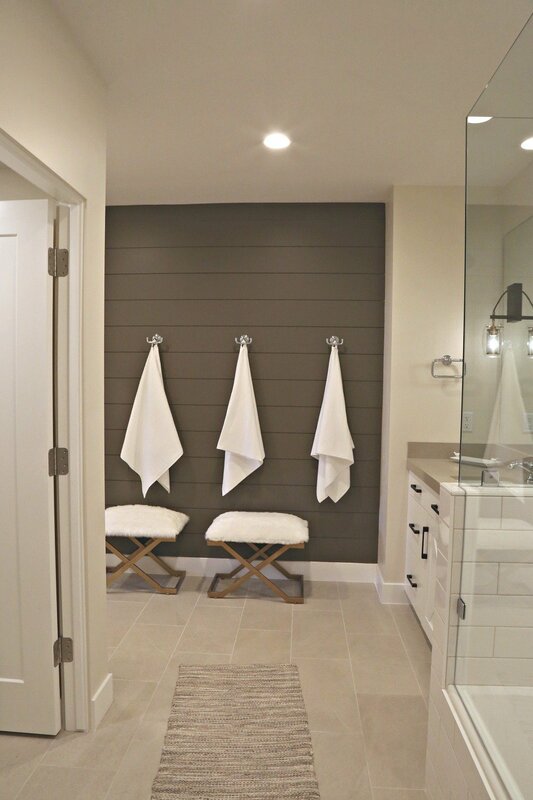 One of the design elements that I saw in almost every new home was painted shiplap accent walls and I’m not talking about traditional white painted shiplap. I’m talking beautiful and rich deep colors that is such an easy and beautiful design idea! Of course, painted white shiplap has been popular for several years now thanks to Chip and Joanna, but what’s new to me are painted shiplap accent walls in beautiful rich statement colors. It has a dramatic impact and I fell in love with the look and we’re now doing it in our client’s homes. 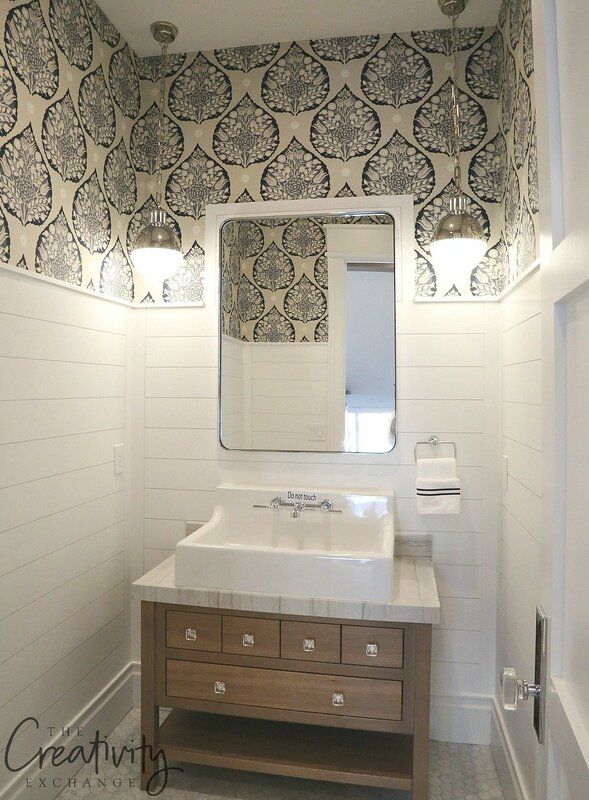 In the Magleby Construction home, I loved the deep rich painted shiplap wall in the guest bathroom that was painted with Sherwin Williams Griffin. 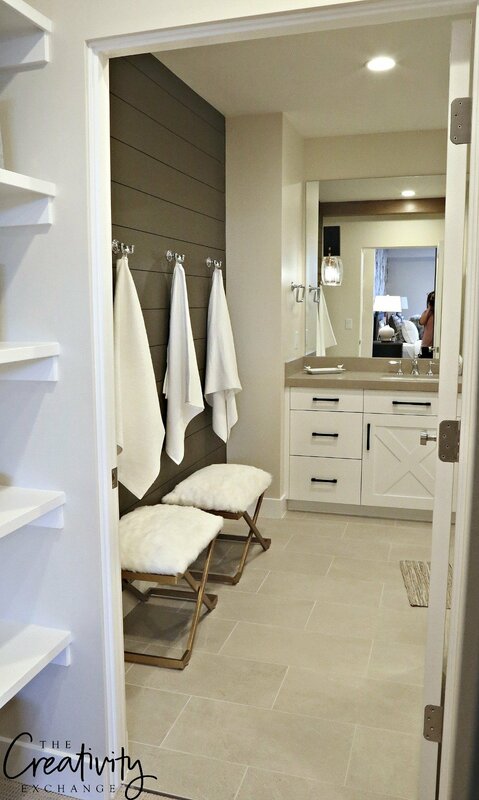 Notice that this whole bathroom is completely off-white except the accent wall. The rich color used as an accent wall on the shiplap instantly turned an otherwise basic white bathroom into something stunning! 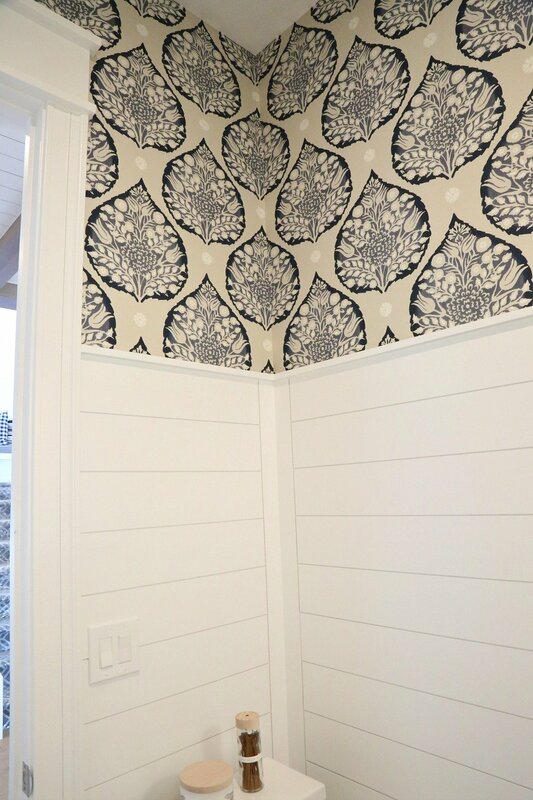 This painted hallway shiplap wall was my favorite in the J Craft home. The whole home was white except a couple statement walls and it had such a beautiful and dramatic impact! Here’s a closer look at the wall painted with Benjamin Moore Kendall Charcoal in a matte sheen. 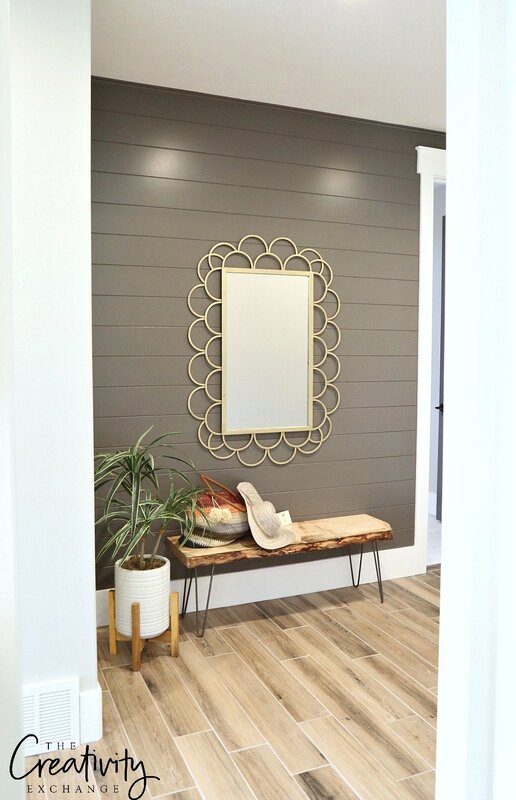 In the Hardrock Home, I loved this painted shiplap accent wall in the hallway painted with Kwal in the color Brainchild. Are you noticing a pattern in these deep rich colors? Here’s another beautiful painted shiplap accent wall in the Elevation Homes in the home theater. 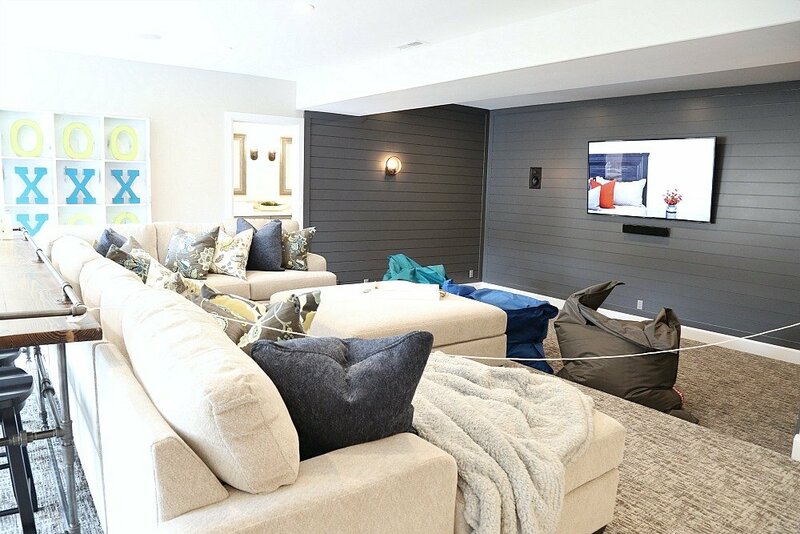 By the way, larger media rooms and home theater spaces was another big trend this year! These richly painted shiplap walls were not just limited to walls either! I loved this painted shiplap ceiling. Really creative idea! 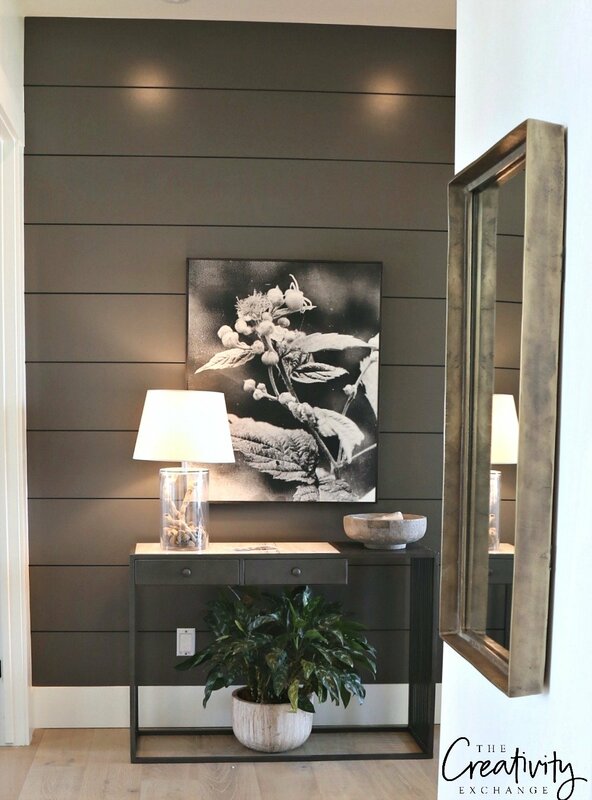 The painted shiplap accent walls that I saw were not just limited to these dark rich colors. 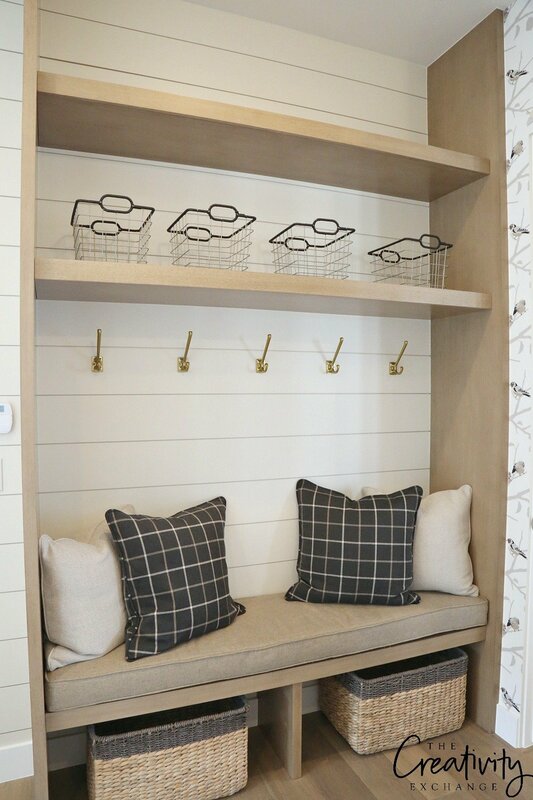 I absolutely loved the twist on traditional brighter white shiplap with these painted off-white color in the mudroom/laundry room of the Magleby Construction home painted in the color “Clunch” by Farrow & Ball. 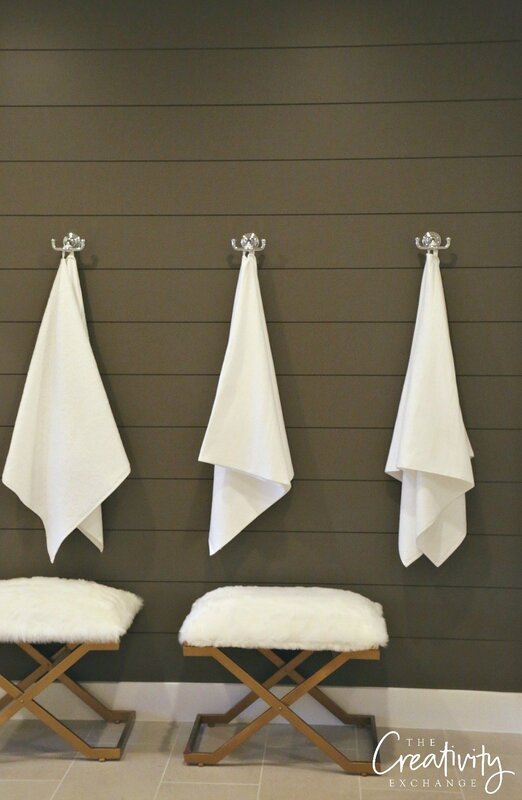 This (new to me) color called “Clunch” from Farrow & Ball was used throughout the Magelby Construction home and I especially loved in the guest bathroom on the shiplap. You can really see just how creamy and beautiful this color is if you look where the shiplap stops at the ceiling. 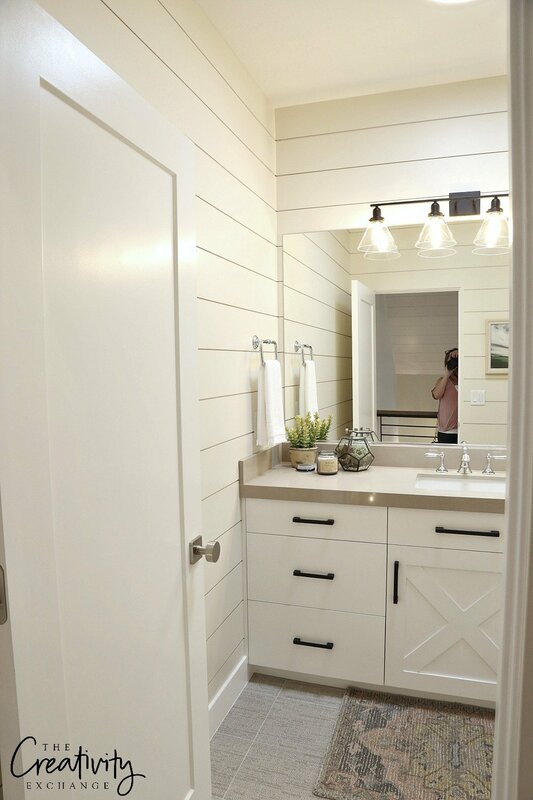 Love the look of an off-white on shiplap as an alternative to white. 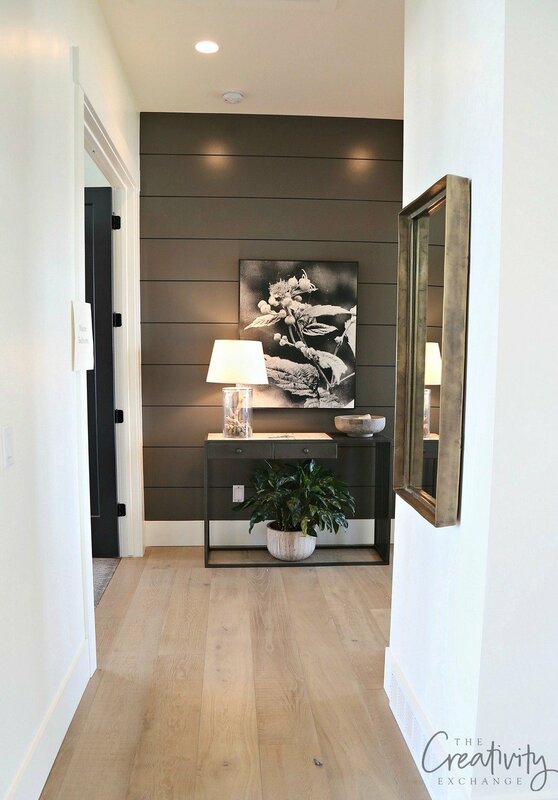 Of course, I did still see lots of beautiful white shiplap walls as I expected but I especially loved the way Silverhawk Enterprises builders used shiplap just like they would wainscoting. It’s a fantastic idea because it gives a more updated look. Interesting that the builder took the shiplap higher than what we have been seeing in traditional wainscoting and I LOVE that look as well. They used one of my favorite white’s on the shiplap and throughout this home and the color is Benjamin Moore Super White. Fantastic color! So what do you think? Are you ready for a shiplap accent wall in your home? I was trying to think of other deep rich colors to add to throw out as possible considerations and I love the idea of a rich navy painted shiplap accent wall. Benjamin Moore Hale Navy would be gorgeous! I also like the idea of an almost black like Benjamin Moore Wrought Iron. So many great possibilities! If you haven’t had the chance to look at my Salt Lake City 2017 Parade of Homes recap, you can find that here. By the way, if you’re starting to think about Christmas decorating, I have been sharing a lot of Christmas projects on my Facebook page here. I’ll have a sneak peek on Wednesday here on the blog! 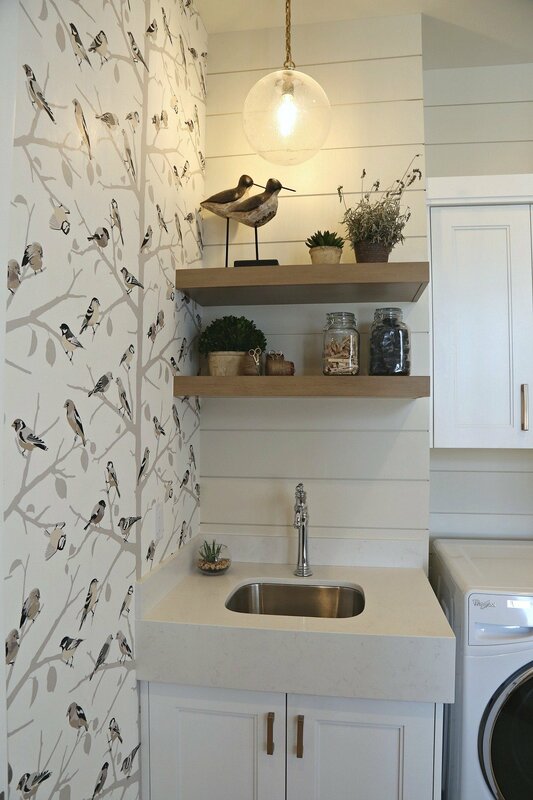 Thank you Cyndy for the great shiplap pictures, I have always loved shiplap. 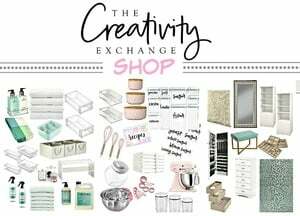 Love all these ideas, really thinking some of these for my house in 2018, can’t wait! I love shiplap! I especially liked the shiplap on the bedroom ceiling! 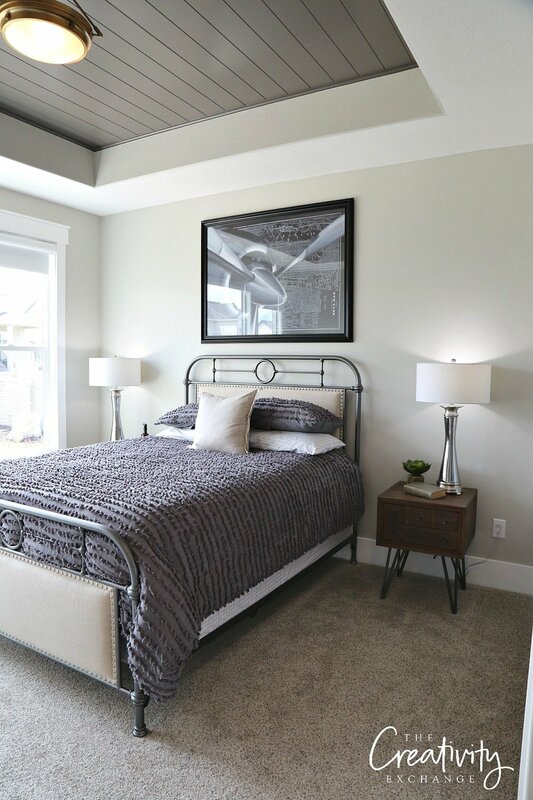 I really like the head/foot board and also the bedspread. Are these items available to order? Where did the bathroom tile come from that looks like fabric?